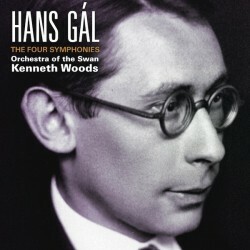 In 2014, Kenneth Woods and the Stratford-upon-Avon based Orchestra of the Swan made musical history when they completed the first ever recorded cycle of the Symphonies by Hans Gál. By dusting off the Austrian émigré composer’s gorgeously melodic and finely crafted scores, which remained relatively dormant throughout the 20th century, Woods has captured the imagination and introduced a new generation to Gál’s wide-ranging and extensive oeuvre. The four symphonies, each originally released alongside those of Robert Schumann, are re-mastered and presented all together for the first time, opening the door to further exploration and discovery.